The quiet hum and rhythmic click of a slide projector were once common sounds in the classroom, conference room, and living room. In a darkened room, information and memories were projected onto a screen or even a blank wall via a unique format: the 35mm slide. In a world where technology changes rapidly, the once ubiquitous slide format is now an artifact of yesteryear. Why should you consider transferring your 35mm slides to a digital format? Do you still own a projector? Without a light source behind them, 35mm slides cannot be enjoyed. Few people today own the projector or viewer necessary to display their slides and leave them forgotten in the family attic. In addition, many old projectors emit quite a bit of heat, which can damage the slide when inserted into a projector for viewing. 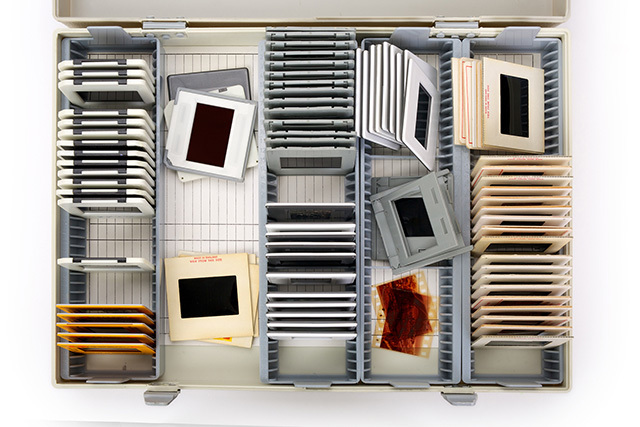 Without careful storage, slides are prone to physical damage, which could compromise image quality. The transparent window of a slide is easily scratched, and the plastic frame can become warped. Color slides are especially sensitive to light exposure; even regular old daylight can fade the image dramatically if exposed for a length of time. And don’t forget about the dirt accumulated over the years! At Advanced Media Integration, we carefully remove the dust and debris before scanning to create the optimal digital image to be enjoyed for years to come. Precious memories locked in the 35mm format are difficult to share with friends and family. Imagine how a family reunion or 50th wedding anniversary could benefit from easily displayed and shareable digital versions of your slides. When you convert a slide to digital, you are investing in your family’s history and future. Here at Advanced Media Integration, we want to breathe new life into those memorable moments by transferring your 35mm slides (standard or double-sided) to data CD or DVD. By using our top of the line scanning equipment, we can take a forgotten memory and make it fresh again. Please contact us to learn more about how we can preserve your family memories.